Three goals in the first 14 minutes set Bognor up for a superb county cup semi-final triumph over the youngsters of Brighton. Harvey Whyte set the ball rolling in the third minute and Brad Lethbridge headed in a second two minutes later. Leon Maloney added a third before the quarter-hour mark. The Brighton keeper spilled a Mason Walsh cross over the line a minute into the second half before Haydon Roberts got one back. Sub Jimmy Wild's individual effort made it five on a night to savour for Rocks fans. 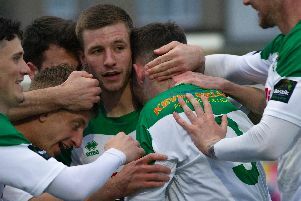 They will face fellow Bostik premier side Burgess Hill - and former captain Dan Beck - in the final at the Amex Stadium in May, with the exact date yet to be confirmed. Bognor went into the game with a fairly strong starting XI despite the likes of Doug Tuck, Calvin Davies and Jimmy Muitt still being injured. 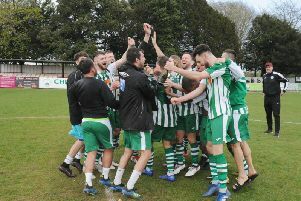 There was a first place in a Rocks squad for dual-signed attacking midfielder Emmett Dunn – three days after he scored the goal which made sure of Chichester City winning the SCFL title. There was one familiar face in the line-up for holders Brighton – left-back Joe Tomlinson, who has been on loan all season at Nyewood Lane from Brighton. The Seagulls had eight U18s in the line-up. The Brighton youngsters visited Bognor last July on an evening much warmer than the chilly one that greeted the crowd at Culver Road. On that occasion Bognor ran out 2-1 winners. Three minutes the Rocks had the ideal start with a goal from skipper Whyte. Richard Gilot started the move with a ball out to Whyte on the right before it went to Walsh in the box. He controlled it and laid it off to Whyte just outside the D and he fired a low right-footed shot that hit the base of Billy Collings' right-hand post and in. Two minutes later it was 2-0 as another quick attack ended in Walsh's shot from 15 yards being deflected up in the air and dropping for Lethbridge to nip in and nod it over a stranded Collings. Bognor almost got a third in the 11th minute when a low ball in from the right ricocheted into the path of Maloney, who poked his shot a couple of feet wide from 10 yards. Three minutes later they – and Maloney – did get the third. It was another attack down the right and this time Lethbridge had first go at the cross before backheeling it to Maloney, who converted from close range beneath a helpless Collings. The young Seagulls finally managed a shot at goal in the 18th minute and it was Matt Everitt who hit it after a neat build-up through the middle, but it was an easy take low down for Dan Lincoln. Bognor were pressing for a fourth and Lethbridge was not too far off it with a curling shot that went high and wide. Then Maloney set up Walsh for a run and cross but his delivery was off. Roberts surged into the box for Brighton but was forced wide before shooting into the side netting. Brighton did find the net in the 32nd minute – but it was the net behind the goal that stops wild, stray shots ending up with a ball lost to a garden. They did better a minute later when Lorent Tolaj ran into the area and drew a sharp low save from Lincoln, with Harvey Read clearing the loose ball. Lethbridge beat two Seagulls before unleashing a left-foot shot from 25 yards but it was high and wide as Bognor continued to boss things. Brighton's best effort came from Jack Spong on 37 minutes and the midfielder's sweetly hit shot from outside the box almost caught out Lincoln as it flew narrowly over. Maloney was almost in on goal after a long ball and got a shot away despite a defender's attentions, but it was deflected just wide. A Tomlinson cross caused a scare for Lincoln a minute before half-time but he did well to punch it clear from under his bar. A Brighton break in first half stoppage time should have resulted in them getting one back but the chance went begging without Lincoln being troubled. A minute into the second half it was 4-0 and unfortunate keeper Collings managed to spill the ball into his own net when Walsh swung in a high cross after a short corner. Two minutes later Roberts pulled one back for Brighton after a scramble in the Rocks box. It was a breathless start to the second half and Bognor's job now was to calm things down and snuff out any hopes of a Brighton fightback. The Rocks were straight back on the attack and Ashton Leigh almost nodded in a Whyte cross but couldn't direct his header on target. Ryan Longman curled a 20-yarder off-target as the Seagulls looked for a second. Lethbridge was replaced by Wild just before an hour was up and the sub's first involvement was to dispossess a Brighton man in the Rocks half. Tomlinson got forward for a fierce shot that was charged down, then Longman drove at goal but found a defender's boot. Wild and Maloney combined to open up a chance but Wild's eventual shot was straight at Collings. Then Walsh ran at the defence and saw his right-footed shot deflected for a corner. From the kick, Widdrington had space for a rasping shot at goal that Collings pushed away when it was bound for the top corner. Brighton replaced Longman with Stefan Vukoje on 68 minutes. But that didn't stop the Bognor flow and Walsh forced Collings into a diving save with a shot from 12 yards as the 70-minute mark arrived. The Seagulls, to their credit, continued to press and Roberts sent a shot whizzing just over Lincoln's bar. Wild got Bognor's fifth in the 74th minute when he was played in down the left flank, left his marker on the ground and ran in to beat Collings from the acutest of angles. Dunn replaced Gilot for Bognor on 81 minutes with the win in the bag, before Walsh was replaced by Josh McCormick. Spong was booked for a nasty foul on McCormick and Widdrington also saw yellow for shoving Spong after the tackle. Roberts soon picked up Brighton's second booking for another lazy foul. Vukoje ran through in stoppage time with only Lincoln to beat but the keeper denied him one-handed. Maloney had another chance when he raced on to a through-ball and brought a good save out of Collings. Then Widdrington fizzed one just over from 25 yards... as the Rocks remained dominant to the very end. Rocks: Lincoln, Read, Leigh, Gilot, Field, Wood, Whyte, Widdrington, Lethbridge, Maloney, Walsh. Subs: Wild, Scutt, McCormick, Dunn. Brighton: Collings, Moore, Tomlinson, Spong, Clark, Eden, Roberts, Jenks, Everitt, Cashman, Longman, Tolaj. Subs: Tanimowo, Rushworth, Lopata, Packham, Vukoje.